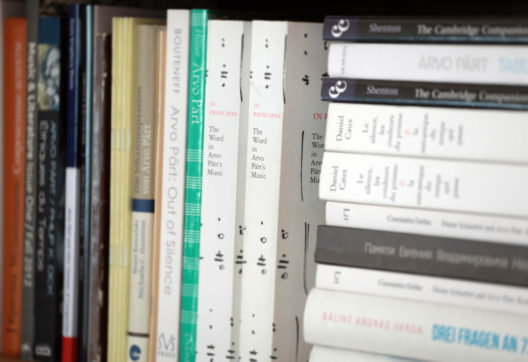 Arvo and Nora Pärt’s personal library, which consists of approximately 2,000 books, mostly on music, art and theology forms the core of the library. The majority of books in the collection are on Orthodox theology and spirituality, which has been an important source of inspiration for the composer. The library’s collection has gradually been supplemented by works on music history and musicology as well as biographical and theological books. The additions also include books presented by the visitors to Arvo Pärt Centre and admirers of Arvo Pärt’s work. The library holds a comprehensive collection of scholarly and non-scholarly materials on Arvo Pärt’s work. It also includes the refined and published final scores of all of Arvo Pärt’s compositions which are the basis for performance. We welcome visitors to use our audio and video recordings on site. One part of our collection includes a large number of records, CDs and DVDs from composers and interpreters with whom Arvo Pärt has met during his long creative career. The holdings of our library are represented in the online catalogue ESTER. The library collections are displayed on open shelves, so that readers can browse and choose the books by themselves. For using the most valuable and rare books a request should be made. Books are arranged on the shelves according to the Universal Decimal Classification System, our library guide (link) will make it easier for you to find the books you need. What can you do in our library? The books and materials in our library can only be used on site. 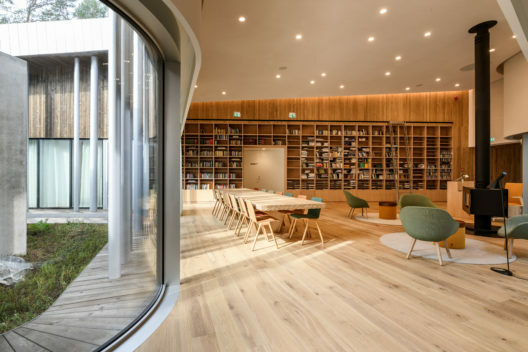 If you cannot come and visit our library at Laulasmaa, you can place an order in the reading rooms of the National Library of Estonia. You can listen to music and watch the videos. information search skills training for individuals or groups.